We have teamed up with Allstate Insurance and their VehicleVibes.com website to help promote safety. 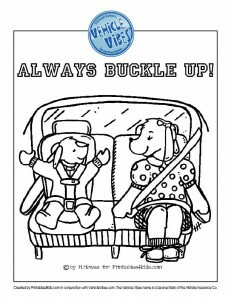 Our first activity, Buckle Up for Safety, with the popular Printables4Kids pups is a cute coloring page that can be used for a classroom activity for kids of all ages. My kids love the printables. Mostly Olivia she loves the tooth fairy print! So does Jack he loves themath worksheets.